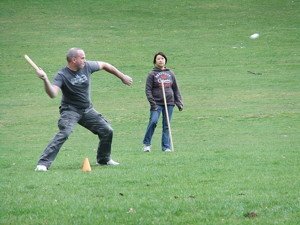 The game of rounders dates back as far as 1744 where people literally started to hit a ball with a stick. Since then the game has evolved somewhat of which you can read more of in this article. For those of you familiar with Baseball then you will likely pick up the rules of rounders pretty comfortably and notice many similarities. The object of the game is to hit a ball (roughly the size of a tennis, but much harder) with a bat. Once the ball is hit you then need to run around 4 bases to score a run. The team with the most runs at the end of the game is deemed the winner. The dimensions of a rounders pitch can vary dramatically in size depending whether you are playing professionally or just recreationally. Any open space will do as long as the required markings can are apparent. Professional pitches include 4 posts, a pitching square and a batters square. The posts run in an anti-clockwise direction – if you were looking from the batters square. The first post is 12m away from the batting square, the second 12 metres away from that, the third 12m metres from there and the 4th 8.5m away from the last. The first three posts are the start of diamond formation whilst the 4th post is found on the baseline and runs straight down from the third. For each game the batters will use either wooden, aluminium or plastic bats which should all be of a smooth surface and with a handle at the bottom for grip. The balls can be white or coloured, but will more commonly be white – baseballs can be used for rounders. Players may wear studded footwear in wet conditions such as football boots, but spiked footwear such as running shoes are prohibited at all time. Each team is made up of 9 players. This can vary depending on the level of match but all teams must have an equal amount. If one team has more than the other then the same numbers of batters and fielders must be used for both teams. Where applicable substitutes can be used but can only bat in the order of the player they are replacing. Where teams are mixed with male and female members each team cannot contain more than 5 male players. To score a point a player must hit the ball and make it round to the 4th post before the next ball is bowled. If a player manages to get to the 4th post without hitting a ball then half a rounder is scored. A half rounder is also awarded if a penalty for obstruction is caused by the fielding team, 2 consecutive no balls from the pitcher and 2nd or 3rd post is hit by the original batter before the next ball is bowled. The team with the most points at the end of the game will be declared the winner. If the game is a tie then it goes to the team with the most full rounders. Each game is officiated by a bowling and batting umpire. These umpires are to adjudge the integrity of the game and also pick on any infractions whilst the game is taking place. It’s also up the umpires to try and keep all players safe as well as keeping equipment in the best possible order. Whilst waiting to go into bat, the batting team must all wait in the batting area found 10m behind the playing line. Two areas should be constructed, one with the waiting batters and the other with the out batters. Each batter will face just one delivery. It’s up to them to try and get to first post before being given out. If a player reaches the first post but then breaches one of the out laws, then they will be given out. A no ball will be called if a bowler fails to bowl the ball underarm, the ball is above shoulder or blow knee height, ball bounces before reaching the batter, is too wide of the batter for them to hit the ball or the bowler’s foot is outside the pitching square. Players can be given out by being caught, foot outside the batting square, running inside any of the posts, stumped at a post before they reach it (must be running to that post), overtaking a fellow batsmen whilst running, throw the bat or lose contact with the post before the ball is bowled.